Sam Tageson, the Inspirational Super Fan for the San Jose Sharks, Receives an Upper Deck Rookie Card! Make-A-Wish® recipient Sam Tageson was presented with his very own Upper Deck hockey card at a charity event in San Jose! CARLSBAD, Ca. (June 10, 2014) – The San Jose Sharks provided hockey fans with one of the most memorable moments of the season when they signed super fan, Sam Tageson, to a one-day deal with the team. Make-A-Wish® Greater Bay Area and the Sharks Foundation worked in unison to make this dream come true for Sam Tageson, who suffers from hypoplastic left heart syndrome and was told he should never ride a bike, let alone play hockey. 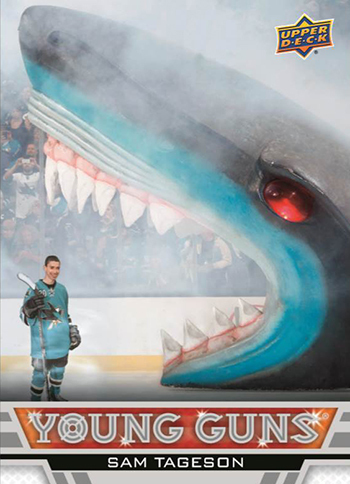 Fans fought back tears as they watched Sam skate out of the Shark Head, an honor that until now has been reserved only for San Jose Sharks players. Sam was announced along with the rest of the team roster and a larger than life headshot of Sam was shown on the Jumbotron for all to see. While that moment was extremely special for Sam, it couldn’t last forever, or at least not until Upper Deck got involved. Upper Deck presented Sam at a charity event at Stevens Creek Sports Cards recently, with his very own Upper Deck Rookie card featuring Tageson adjacent to the famous San Jose Shark Head. Tageson was also surprised when San Jose Sharks defenseman Jason Demers and San Jose Sharks Radio play-by-play announcer Dan Rusanowsky showed up at the unveiling and were first in line to have Sam sign his new cards. memorable event was captured on video and can be seen on YouTube. The event provided Sam with the opportunity to give back to the charities that gave such an amazing opportunity to him. Sam signed items for fans, with all the proceeds going to Make-A-Wish® and the Sharks Foundation. Several thousand dollars were raised at the event and with more coming in as fans donate to these organizations in order to obtain one of Tageson’s Upper Deck Rookie cards. Upper Deck will be inserting a limited amount of Sam’s Upper Deck rookie cards in the company’s 2014-15 NHL® MVP set which is scheduled to release in early August.